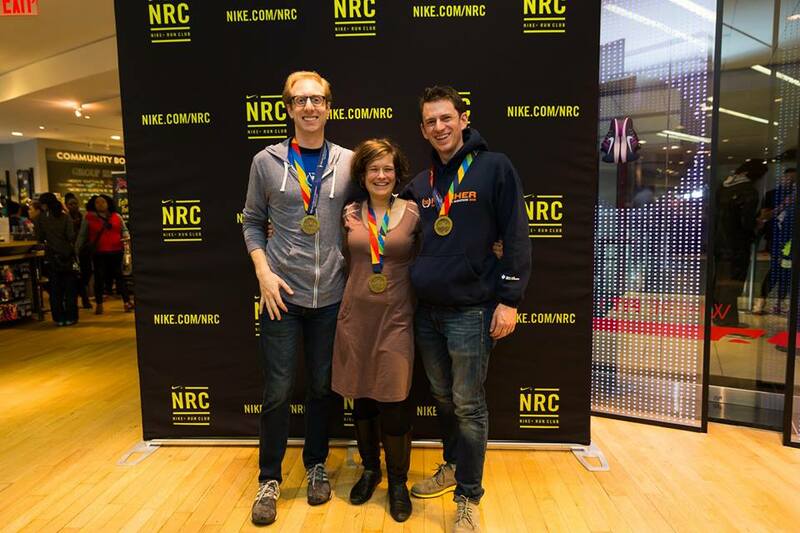 Me, Terri, and Billy from NP_NYC celebrating with our medals the day after the marathon! My hair looks particularly gingery in this pic. The NYC Marathon happened. Social media exploded with excited posts, likes, and comments from runners, their friends and family, and spectators’ pictures of runners and funny race signs. Everyone who completed the Marathon has a story. For some, finishing allowed them to cross an item off their bucket list. For others, this represented yet another NYC Marathon, special in its own way but certainly not a new experience. And for others, it represented a celebration of their personal growth. My story falls into that final group. Before I get to that story, though, let’s break my race down by the numbers. My previous marathon PR was 3:55:17 on a flat course, run 11 years ago. My only other marathon time was 4:10ish, also run 11 years ago. On Sunday, my 2:57:56 bested my previous marathon PR by almost an hour and qualified me for the 2017 Boston Marathon. So, this race solidified not only my return to endurance running, but a complete transformation. However, considering my personal growth, this race demonstrated how far I’ve come since the fall of 2012, when I was in my final year of law school. I had done well academically but not received the job offer I wanted. My relationship of almost five years had ended. After starting law school weighing 162 pounds with a 10k PR of 45:03 (7:15/Mile), I found myself weighing 198 pounds and unable run for more than a mile. I had completely isolated myself from family and friends. I came to school for class only, spending the rest of my time in my apartment watching Netflix and drinking whiskey alone, or hanging at the Upper West Side’s diviest bars. I did the bare minimum of schoolwork, which somehow resulted in straight A’s (including an A+ . . . seriously, I cannot explain this), and people left me alone. I either refused to talk to my family, or erupted in anger during conversations. I blamed everyone else for my misery. I ruined family holidays and convinced new “friends” that I was the unluckiest man alive. This fueled my cycle of resentment, fear, anger, and drinking. By February of 2013, I hit a complete mental, physical, and emotional bottom. My family, despite years of me pushing them away, helped me straighten out. I could no longer blame them or any other external circumstances for how I felt: The negativity came from within me, and the only way to change that feeling was to accept responsibility for my actions, clean up my past, and work hard to live a healthier life based on personal accountability. Slowly but surely, through the help of family and friends I came to accept the world around me and, more importantly, I came to accept myself: shortcomings AND positive qualities. Simultaneously, as I got healthier I began to revisit old personal interests, including running. I signed up for the Scotland Run 10k and the Brooklyn Half Marathon, and planned to run both races in early 2014. The last race I had run was a 10k in June of 2010. However, as my personal issues continued to plague me, I skipped both races because I failed to train for them. I did, however, sign up for the 2014 Staten Island Half, completed the training for that race, and ran it in 1:44:42. I wore a six-year-old pair of sneakers, gym shorts that I owned since high school, and a long-sleeved running shirt about two sizes too big during the race. After the Staten Island Half, I knew I could run faster, so I began training hard. I analyzed training plans online, read articles about running and nutrition, and ran the Fred Lebow Half in January in 1:36. I joined New York Sports Club and began training once a month with a trainer who specializes in collegiate endurance athletes. I did interval training, speed work, and hill sessions. I ran a 5k in under 20 minutes. My race bibs now placed me in the first corral of NYRR races. I decided the 2015 Brooklyn Half would be the race at which I would show the world just how fast I’d gotten. I trained for a sub-1:25 time. All of that intense training, combined with some ill-advised attempts after reading Born to Run to change my running stride from a heel strike to a forefoot strike, caused me to develop a stress fracture in my right sacral ala, an injury generally found in elderly women with osteoporosis (seriously! Google it). I despaired, somewhat comically, and thought I might never run again. Nevertheless, I did something that I might not have done in the past: I asked for help. When the doctor recommended that I use crutches for five weeks, I did it even though he said that I could heal without them (albeit over a longer period). I followed his advice and swam, worked on strengthening my core, and lifted weights only while in the upright sitting position. Once off crutches, I waited three weeks to hit the treadmill, worked with a physical therapist, and learned about what exercises to perform to reduce the risk of future running injuries. I also learned that I should run how I run, and not worry about the latest trends in running form. My coworker introduced me to The Big Book of Endurance Training and Racing by Dr. Phil Maffetone, which provided a method to increase speed without high intensity intervals and speed work. I also learned how to properly incorporate speed work into a training plan, and realized that I had been doing way too much, way too early on in my fledgling adult running career. Most importantly, I finally understood that running for anyone besides yourself is a dangerous game. I reconnected with the joy I feel every time I get to hit the Central Park loop at 5:30 a.m. If I got faster, awesome. If not, who really cares? The point was that I could run and have fun with it and let that be its own reward. This freed up a ton of mental space. The rest of my story? Well, it’s mostly contained in my past blog posts. I found November Project NYC through my sister. I ran the Percy Sutton 5k in a PR time of 18:24, my first race at a sub-6 minute pace. I stayed focused and ran the Bronx 10-Mile in 1:00:20 (6:02/Mile) and the Staten Island Half in 1:20:52 (6:10/Mile), which time-qualified me for the 2016 NYC Marathon. Throughout all of this I continued to hit the gym at least once a week to strengthen my legs, and multiple times per week to strengthen my core and to stretch. I listened to other people’s advice about the NYC Marathon, ate well, and stayed focused on the race despite all the hype during the week before. I woke up on race day weighing 162 pounds (36 pounds less than at my heaviest!) and ran that marathon in under three hours. As I ran up West Drive in Central Park for the final .2 miles of the Marathon, I thought about all these things: the useless resentments that have given way for acceptance, the isolation that has evaporated into connection, and the paralyzing fear that has melted away into love. And I cried. Not only on the course, but later at my apartment. But the best part? My tears streamed down my face and across a smile. What an awesome story. A personal story of strength and determination to beat down the demons. Very inspiring! I think we all have our demons that must be destroyed, and you, my running friend, destroyed those demons on the streets of NYC. Well done, and best of luck getting even speedier. Thank you so much. We all have something, right? And yet with a little help, we can conquer anything! Sometimes the hardest part is asking for it. Still waiting for your recap! I know, I know. Haven’t even started it yet. Gathered my photos tho. It’s a start.